PHILADELPHIA, PA – May 9, 2017– Janney Montgomery Scott LLC (“Janney”), a leading full-service wealth management, financial services and investment banking firm headquartered in Philadelphia, PA, today announced that Kirk S. Kolligian, Senior Vice President/Wealth Management, has joined Janney’s New Haven, CT branch office. 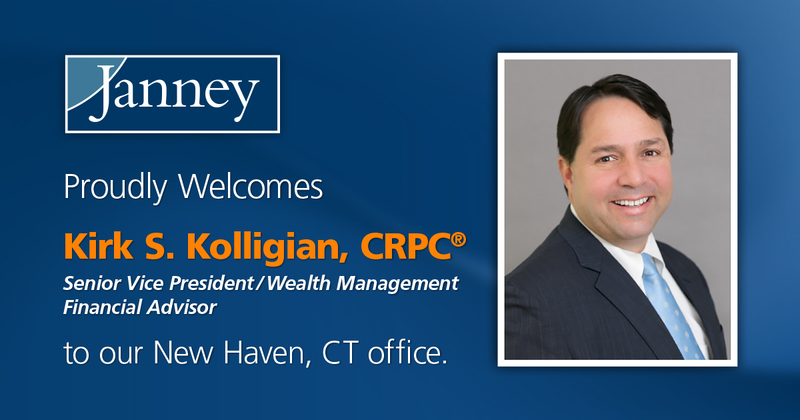 Kolligian is joined at Janney by Lynne Rosenfeld, Private Client Assistant. Kolligian and Rosenfeld were previously affiliated with Merrill Lynch Wealth Management. Kolligian, a 27-year industry veteran, is entrusted with over $144 million in client assets. While with Merrill, he served as the Chair of their Investment Advisory Council and also sat on the Technology Council. He graduated from Tufts University with concentrations in Psychology, English, and Economics, and is an avid tennis player, having competed in numerous USTA tournaments. Janney’s New Haven, CT branch office is located at 555 Long Wharf Drive, 11th Floor, New Haven, CT 06511.